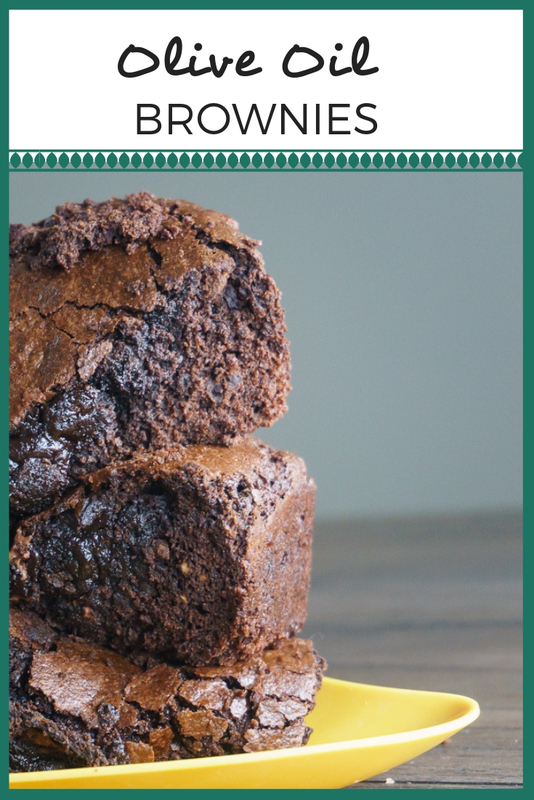 These Double Chocolate Olive Oil Brownies are loaded with rich chocolate flavor and chunky chocolate chips. 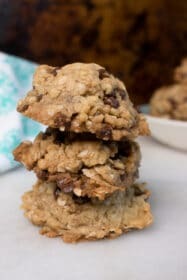 They’re sinfully good and simple to make in just 30 minutes! These are sure to please even the biggest chocoholic in your life! Plus, they’re 100% gluten-free with an easy vegan option. It’s no secret that I’m a bit of a chocoholic. 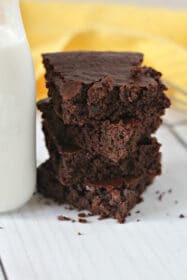 So, when I challenged myself to come up with a creative new way to use olive oil, the first thing I dreamed up was a big plate of chocolate brownies. 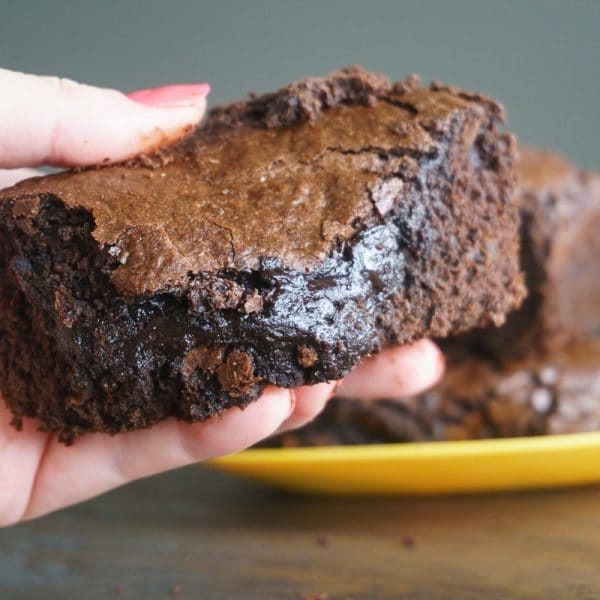 Most ordinary brownie recipes call for vegetable oil. And while that’s perfectly fine, it’s also a bit boring. I mean olive oil is totally delicious right? No one sits around dunking their bread in vegetable oil. Olive oil has so much more flavor. It would have to make my brownies taste better. So I opted to use olive oil instead of vegetable oil in the creation of these Double Chocolate Olive Oil Brownies! And the result is out of this world. 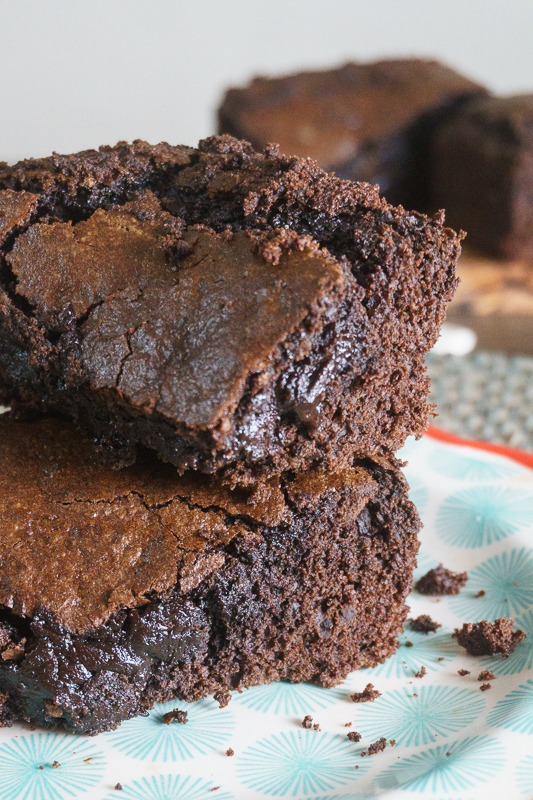 I’m talking the most moist, fluffy, flavorful brownies I’ve ever tasted. You can trust me – I’ve tasted a lot of brownies. If you decide to give this a try for yourself, the most important thing is choosing a high-quality olive oil. It will make all the difference in the flavor of your brownies! 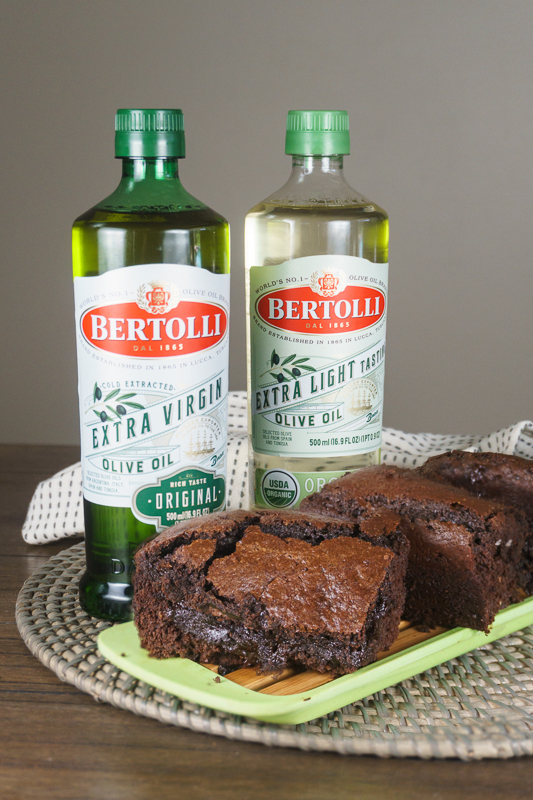 I have always loved Bertolli Olive Oils, and they’re a staple in my kitchen. I know I can rely on them for a delicious fresh taste, and I can trust that they’re made with only high-quality ingredients. Plus, they’re so easy to use in all kinds of creative recipes! In fact, Bertolli is the #1 olive oil brand, with over 150 years of experience. 150 years! No wonder they know what they’re doing. You can learn more about the brand and their products on the Bertolli website. I always buy my Bertolli Olive Oil at Publix, where you can find it in the oils aisle. They have two different varieties – Original and Extra Light Tasting Olive Oil. I used the Extra Light Tasting variety for these olive oil brownies, but either one would work just fine. The Original is the variety I use for most of my day-to-day cooking. 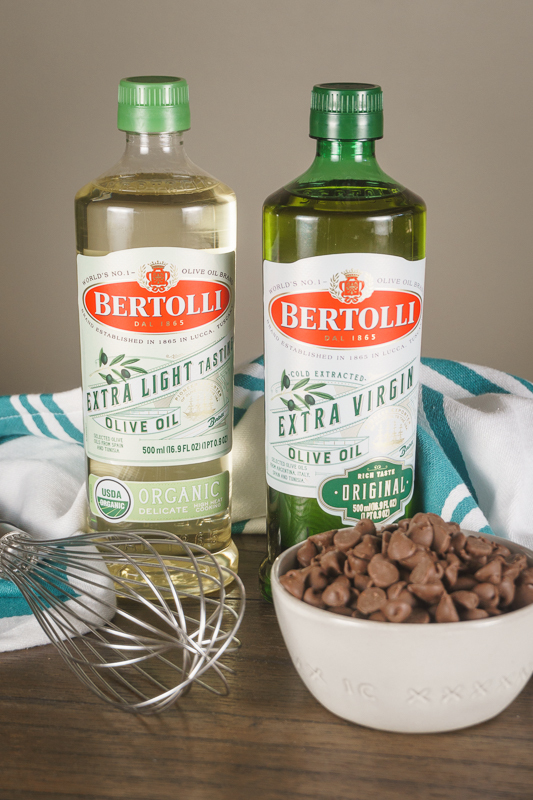 If you want to try it out for yourself, make sure you visit this savings page to save $2 on the 1.5L (50.720z) Bertolli Extra Virgin or Extra Light Tasting Olive Oil. That’s a great deal! And if you’re already familiar with Bertolli Olive Oils, you might have noticed that the bottle has a new look. Don’t worry – it has fancy new packaging, but the same great taste! Now let’s get on with making our brownies, shall we? 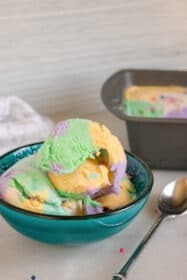 You won’t believe how simple and easy this recipe is. You can have fresh home baked brownies ready in around 30 minutes. Start off by whisking together all of the wet ingredients in a small bowl. This means the olive oil, vanilla extract, water, and eggs. These are super easy. Just take a small bowl, and whisk together two tablespoons of water with one tablespoon of flaxseed meal for each egg that you want to replace (two in this case!). This trick works in most vegan baking recipes and helps hold things together! Next, take a separate larger bowl and mix together all your dry ingredients. This will be the flour, brown sugar, cocoa powder, baking soda, and salt. You can use regular sugar if you prefer, but I think the brown sugar gives the brownies a little extra flavor. If you want to make gluten-free olive oil brownies, just make sure you select a gluten-free baking flour, which is what I used. If this doesn’t matter to you, feel free to use all-purpose flour to keep things even simpler. 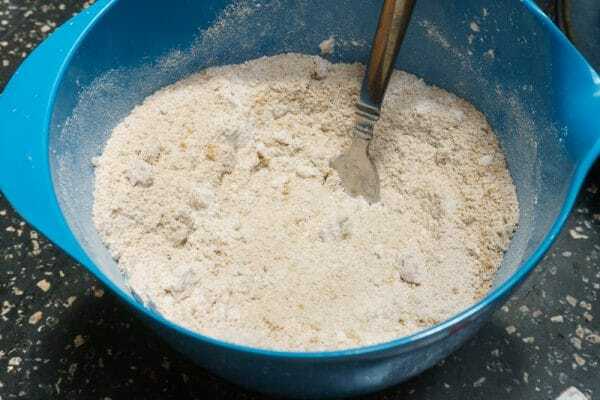 Then, add your wet ingredients into the bowl with the dry ingredients and whisk everything together into a nice, thick batter. 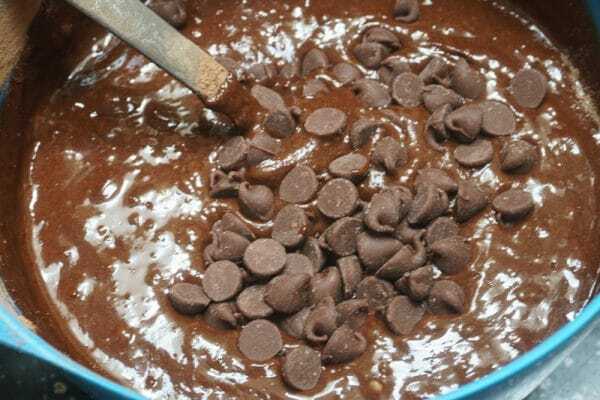 Finally, fold your chocolate chips into the batter. If you’re making vegan brownies, make sure you choose a dairy-free chocolate chip. They are available in the baking aisle of most grocery stores. In fact, Publix had three different types when I shopped for this recipe! 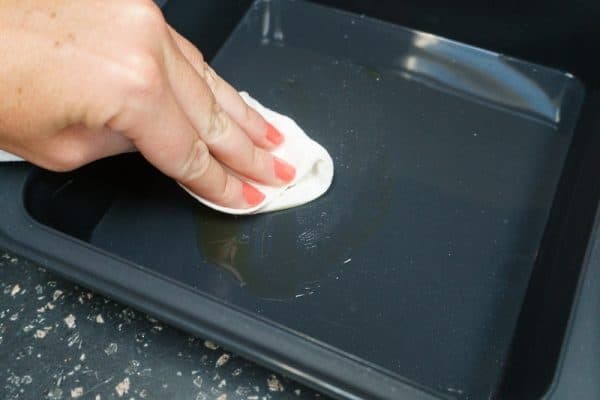 Prepare your baking pan by greasing it with a little bit of olive oil. See how handy this stuff is? Pour your batter into the baking dish, filling it about 2/3 full. Bake at 350 degrees Fahrenheit for 22-25 minutes. Ta-dah! Fresh, home-made Double Chocolate Olive Oil Brownies. 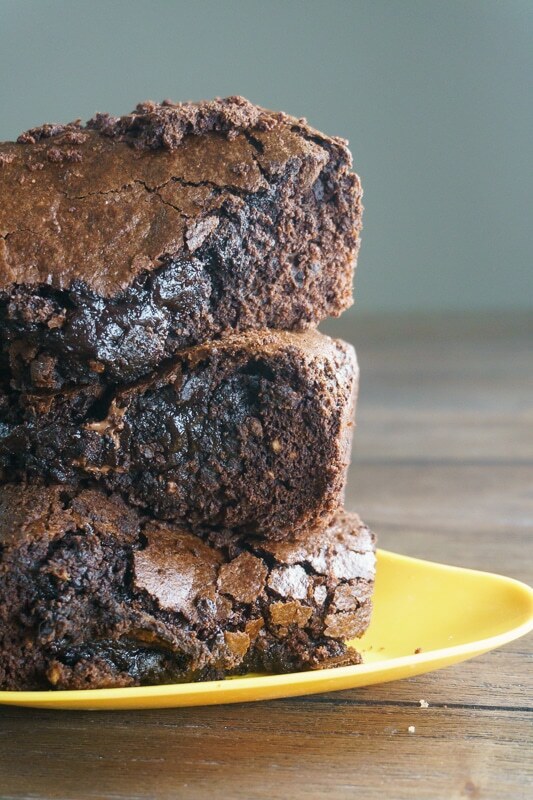 The olive oil really gave these brownies the perfect texture. They are a bit fluffy, almost like a cake, with a rich fudgy center. Perfection. Seriously. 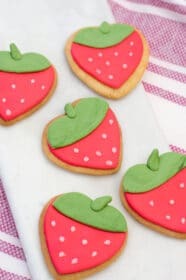 Just stop whatever you’re doing and make these. They were a huge hit with my family. I had to shoo my husband away several times while I tried to take these photos. 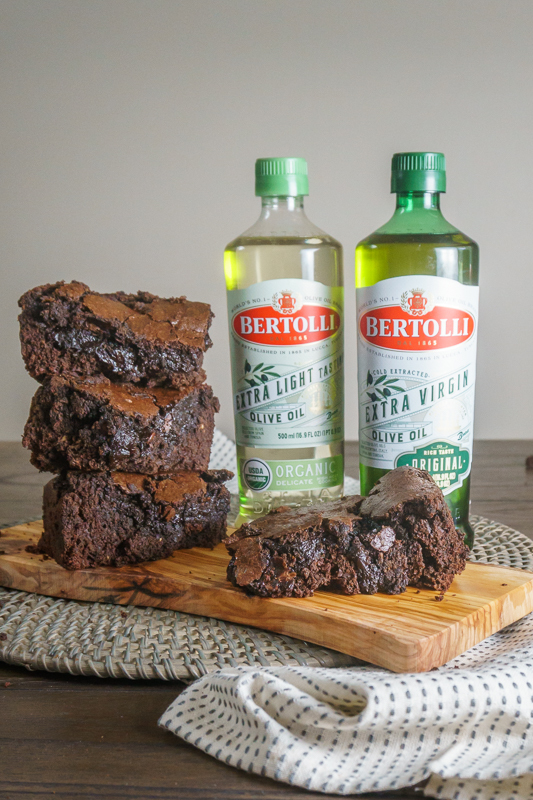 I hope you give these Olive Oil Brownies a try. And don’t forget to visit the savings page to save $2 on Bertolli Olive Oils at Publix! 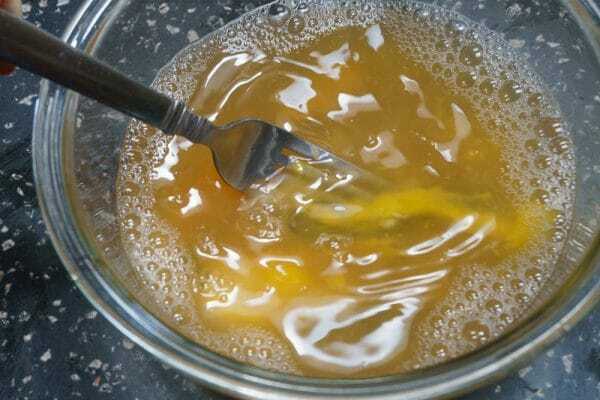 In a small bowl, whisk together the olive oil, brown sugar, vanilla extract, and eggs. 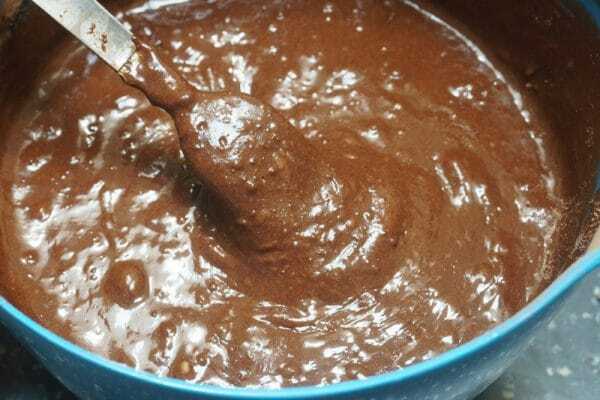 In a larger bowl, mix together the flour, baking soda, salt and cocoa powder. Add the olive oil mixture to the flour mixture, and whisk until smooth. Prepare an 8” x 8” baking pan by rubbing lightly with olive oil. 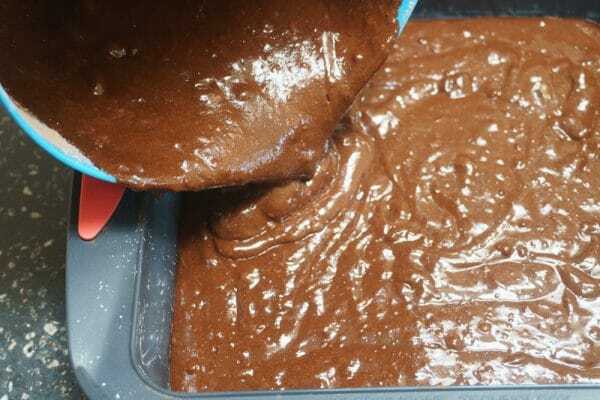 Pour brownie batter into the baking pan. It should be about 2/3 full. 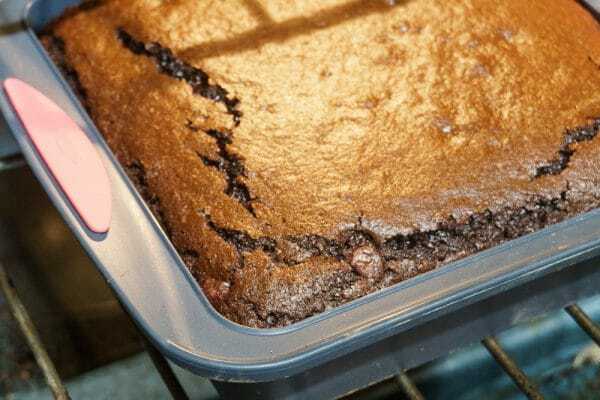 Bake for 22-25 minutes, or until a toothpick inserted into the brownies comes out with just a few crumbles of batter. Let the brownies cool. Slice and serve. 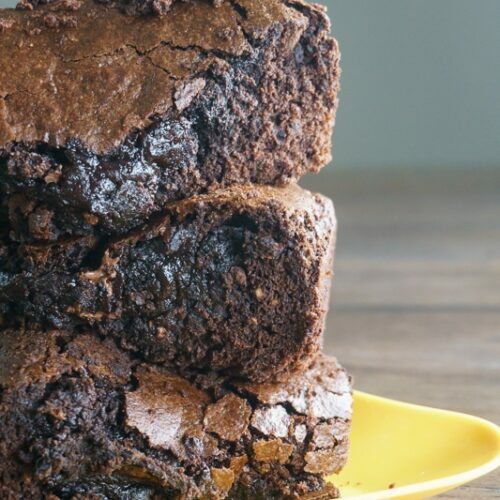 For gluten-free olive oil brownies, simply be sure to use a gluten-free baking flour. Almond flour or coconut flour are also good choices. 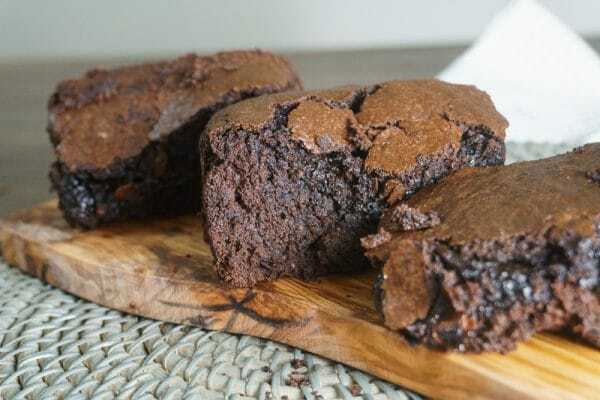 For vegan olive oil brownies, replace the eggs with flax eggs. 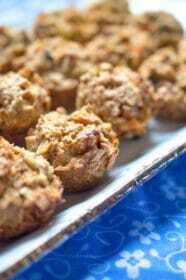 To make a flax egg, whisk together one tablespoon flaxseed meal and two tablespoons water for each egg being replaced. Also ensure that you select dairy-free chocolate chips, which are available in the baking aisle of most grocery stores.